I hope you had a blessed holiday. It is good to be back. I missed you guys! You will probably notice a few things have changed since last year. I have a new theme. It’s called Misty Lake. Things seem to hide in the mist. It is less distracting. Or so they say. Not sure if I like it, or if I will keep it. What do you think? Distracting or not? Another change is no advertisements! I do like that. For the first post of this year I am accepting an award. Yippee! I would like to thank my beautiful friend, Robbie Pink of Captive Dreams Window ~ Dreams No Longer Captive Blog for nominating Center of His Wheel for the Blogger Recognition Award! I started my blog for several reasons. Writers are encouraged to have a platform. However, I knew nothing about blogging so I waited for several years and gathered information. Finally, after much prayer and knee knocking, I decided to take a leap of faith (Even though I am still dumb as dirt on the matter!). An expert I am not. 🙂 I am still crawling while honing my skills. Another reason was, and is, to share the blessings of God with others. After almost a year, I have no regrets with my decision. I have met some wonderful people I wouldn’t have met, otherwise. To the new blogger, I would say to swallow your fear and write. Never stop learning. Seek out the professionals and read what they are saying. There are some wonderful people who are willing to share their advice. Ask. Then do it! 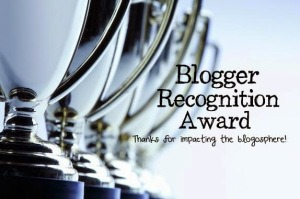 Now for the blogs I nominate to receive this award. So, there you have it. An interesting group! They have made me laugh, cry, and think as I have read their post. Be sure to check them out. I have come to appreciate every one of them for many reasons. This list is just a small list of what you can find. Looking forward to finding more in 2016! Gail, I believe my computer issues have now been resolved. At least I can now comment and like posts! Thank you for your kind words about me! You deserve the award! I only recognize a couple of blogs you nominated, it’s nice to find other like-minded bloggers! Have a great weekend, what’s left, and God’s Blessings! RobbyeFaye, I’m so glad you’re back. Hope those pc issues stay resolved. I know they can be irritating. Thank you so much for your kind words, my friend. The great thing about the award is you find more blogs to follow and friends to make. Hope your weekend is amazing. Thank you for taking the time to stop by and comment. You are right about finding blogs, I always find others to follow. You are welcome, and have a wonderful weekend, too. God’s Blessings! Looks good! Congratulations and Happy New Year! Thank you so much, Sandra. Happy New Year! Thank you so much for the nomination,Mehta a great way to find out about new blogs! I like the theme! And congrats on the award – what a way to start the year! I’ve always liked the Misty Lake theme & don’t find it distracting. And I love the potter’s wheel image you used! Great job! Thanks, Shelia! I love the imagery of the potter’s wheel. I pray your troubles will soon be cleared up and nothing else will go missing! Looking forward to the new year with you! I’m looking forward to journeying with you too! And yes, I hope we outsmarted the thieves!! LOL! Thank you so much for the nomination! I am quite flattered and honoured. And congratulations on receiving it yourself.